1. Look for clothing with a stretch. This Free People top is super stretchy and soft. Mostly made of polyester with some rayon and polyester. Stretchy doesn't mean tight. Make sure that you feel comfortable, don't feel like you are squeezing you and tummy. This goes for tops and dresses. Opt for ribbed texture materials. 2. Length is important. Stretchy and long is super important when wearing a top with a bump. You want it to fit all the way over the bump securely concealing you maternity waist band. 3. As for dresses...Opt for under the bust flowy dresses or flowy dresses in general; like this boho flowy Free People dress or this loose fitted oversize t-shirt dress from ASOS. I also like maxi dresses that are button down and are loose..which are perfect if you plan on breast feed. 4. Try on in store. To feel more secure about your purchases, try shopping in-store so you can feel the material and try it on (bring in a couple of sizes into the fitting room with you). 5. 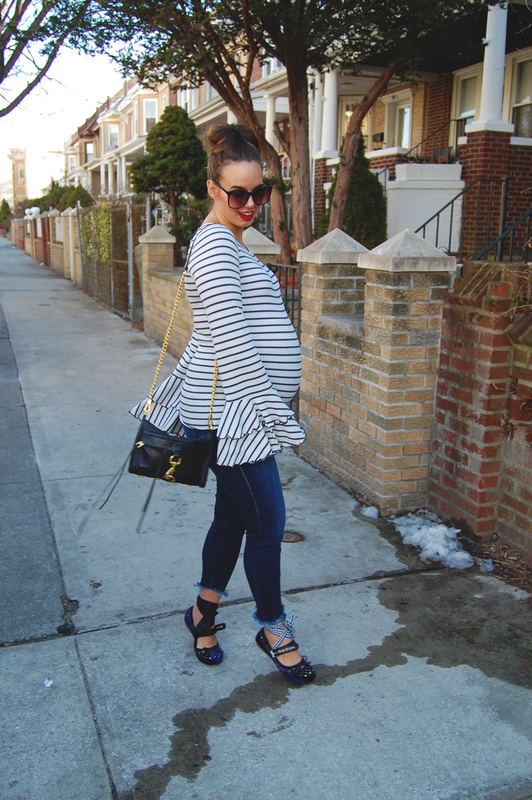 Shop maternity stores that have clothes that have transitional clothing. PinkBlush being one of my favorite boutiques have dresses and tops that take you from bump to post bump. Also have functional clothing that takes you to nursing.